For the husband's birthday - we took a day trip (that turned into a overnight trip) to Lake Tahoe. Everyone wanted a beach escape and heading East sounded easier than West this time. We drove straight to the beach that we always stop at in South Lake Tahoe - El Dorado Beach. After a long drive it is one of the first places you can stop and get your feet in some sand quickly. We played for a while got our feet wet and I had a $75 hotel credit for Best Western that I need to use by the end of Summer ... and with no other vacations planned ... we decided to use it and booked a room at the Station House Inn. We went to lunch at Artemis Lakefront Cafe - a cute greek restaurant with great outdoor seating and great food. They have great little shops to check out, including yummy gelato and a beach with a Hawaiian ice stand. After a quick nap - we walked to Heavenly Village to explore a bit. We ate at McP's Pub - had some great beer - and good food - although I was still full from my awesome lunch gyro and really didn't eat much. We sat outside again - so no worries about kids dropping food or being loud - they were pretty entertained people watching. We walked to Nestle Toll House Cafe in the Village for ice cream sandwiches and grabbed some diapers from Raley's. Bedtime was a bit a disaster... Lucille could not calm down... a bit to excited about us all being in one room. And would not leave Gus alone. But we survived. We woke up and went to the free breakfast... which was great. They have a nice restaurant and they serve you - not your normal free continental breakfast. We walked to the private beach (the hotel has passes to get in) Lakeside Beach. They had a fun playground and the kids really enjoyed swinging with an amazing view of the lake and mountains. Then we walked back to Heavenly Village and rode the Gondola - which was probably the funnest thing for the kids. I can't wait till they are a little older and can do some of the activities on the mountain. Before heading back during nap time (so the kids would sleep in the car) we explored the village some more and grabbed a yummy lunch at California Burger Co. and again, sat outside on the fun fake grass. It was a perfect quick trip for us and minus trying to get Lucille to GO TO SLEEP.... it was great. 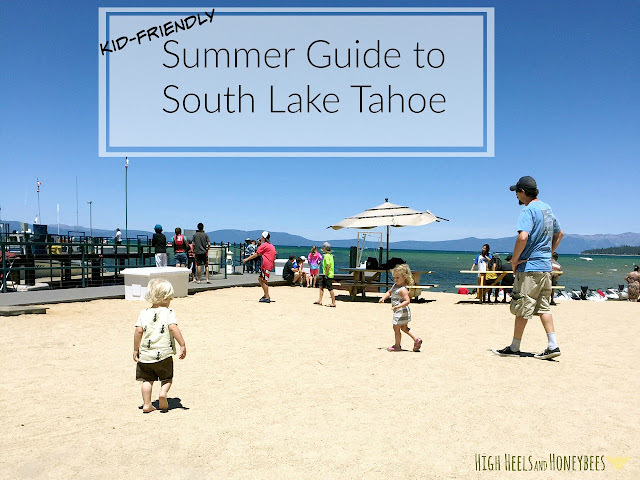 We've decided we are definitely not snow bunnies so Summer is the perfect time for us to go to Tahoe. Hope we can make another trip before Summer is over.